This program enables students from six countries (Thailand, Indonesia, Malaysia, the Philippines, Vietnam and Russia) wishing to enroll in a master’s course (major in one of the sciences) at the University of Tokyo, to secure scholarships before their arrival in Japan. It aims to cultivate individuals capable of leading Asia in the twenty-first century and to contribute to the development of Asia and the world as well as to mutual understanding between these countries and Japan. 1. Applicants must be citizens of Thailand, Indonesia, Malaysia, the Philippines,Vietnam orRussia. 3. Applicants must be under the age of 35 on April 1, 2018. 4. In principle, the applicant must be able to obtain approval of acceptance as a Postgraduate International Research Student (hereinafter “Research Student”), from the University of Tokyo and be registered as a Research Student for April 2018 or October 2018. However, the applicant may enroll directly as a master’s course student of some graduate schools in the University of Tokyo. In that case, the applicant must be able to obtain approval of enrollment from the University of Tokyo and be registered as a master’s course student for Apr 2018 or Oct 2018. 5. Applicants must acquire adequate Japanese language proficiency that is required in order to research and study in a master’s course, when enrolling as a master’s course student of the University of Tokyo. 6. Applicants must apply from the above 6 countries and be able to attend selection procedures when necessary. Scholarships will be provided for max. 3 years, 1 year studying as a Research Student and max. 2 years studying in a master’s course. 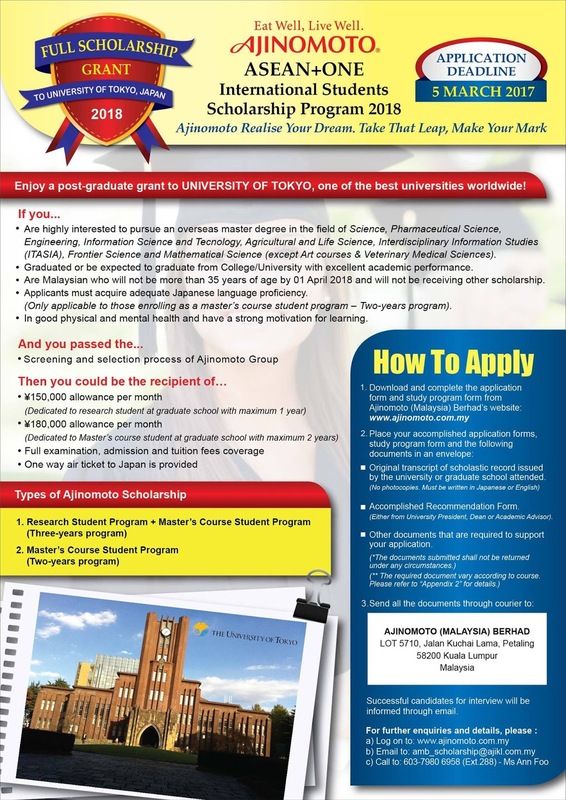 The scholarship will be suspended when the scholarship recipient fails to pass the entrance exam for a master’s course within a year after arriving to Japan if the recipient enters as a Research Student. Applicants can enroll as Research Students or master’s course student in one of the sciences (except medicine and veterinary medicine) of the graduate schools in the University of Tokyo. Refer appendix 1 for details. A copy of documents proving Japanese Proficiency of the applicant, such as JPLT result, certificate of attendance to Japanese higher education facilities and Japanese Training institutions may be considered. 5. Additional documents, TOEFL and GRE, may be required depending on Graduate School the applicant wishing to enroll. 6. The documents submitted shall not be returned under any circumstances. g) Violates the rules and regulations of the University of Tokyo or Ajinomoto Scholarship Foundation. necessary documents for applying to University of Tokyo, assigned by each graduate school. Screening and Required documents for applying as a Postgraduate International Research Student to the University of Tokyo”) The accomplished documents are reviewed by faculty council. For the applicants who are requested to enroll in April, the letter of acceptance will be issued in Jan, 2018. They should take all the adequate process, such as visa, for entering to Japan and will enroll in April. process, such as visa, for entering to Japan and will enroll in April.